Prayers are a critical part of the framework for ongoing evangelization. As we move forward in 2019, all of us are aware of the various revelations, news items and challenges throughout our Church. As Catholics, we know not only that struggle is a critical part of mortal life but that it is, also, an opportunity for redemption and the offering up of sacrifices for sanctification, salvation and other Graces, according to God’s Will. Our faith is so deeply rich, wise and time tested; every aspect of human, spiritual and emotional life is addressed via Scripture, Tradition and the Roman Catholic teachings. Jesus said, “You are Peter, and on this rock I will build my Church, and the gates of hell will not prevail against it” (Matt. 16:18). It is imperative to share this knowledge, practice and personal experience with others. This is done via personal ministry, testimony and other means of education and evangelization. 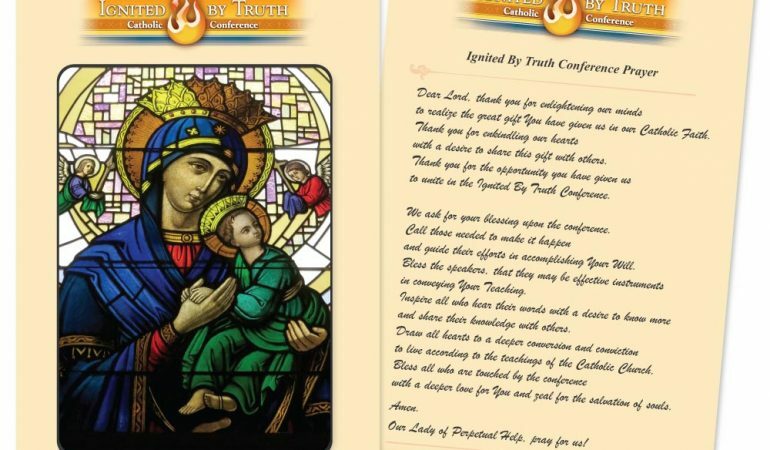 The Ignited By Truth Conference plays an integral role in the local community by instructing attendees on the solid teachings of our Roman Catholic Church as grounded in our Magisterium. You can assist in this mission by intensifying your prayers for the IBT conference, speakers and all of the volunteers who work behind the scenes. Starting today, Thursday, March 28, please join in praying the Novena to the Holy Spirit for the Seven Gifts. Volunteer opportunities are still waiting to be filled. Join the IBT team by sharing or your time and talent. Sign-up at https://ignitedbytruth.org/volunteer/.